Just White Dental is a family dental practice located near the heart of West Ryde in Sydney. We have been committed to providing high-quality, all-inclusive dental care to local families for over 13 years now. We offer a friendly, relaxing, and fun environment, combined with the latest in oral technology and machinery, to ensure our dental services remain second-to-none. What sets Just White Dental apart from other dental practices, is the fact that it is built on trust. Dr Wyndham and Dr Ives are a husband and wife duo who live within the local area with their young family. They are both extremely passionate about providing warm, friendly, and high-quality care to patients of all ages, including children, adults, and the elderly. They each have impressive and in-depth experience within the dental industry, after both graduating from the University of Sydney with a Bachelor of Dental Surgery. Since then, Dr Wyndham and Dr Ives have specifically concentrated on different fields of dentistry with their further education, to ensure they can provide a complete dental practice catering to all of your oral health needs. Our long list of treatments includes complex services such as orthodontics and dental implants, to general dental services including routine check-ups and cleans. The dedicated and passionate Just White Dental team are committed to ensuring your experience at our dental practice is a positive one. We treat our patients as though they are friends, building relationships and trust as we gently guide you down the right path to optimal oral health. 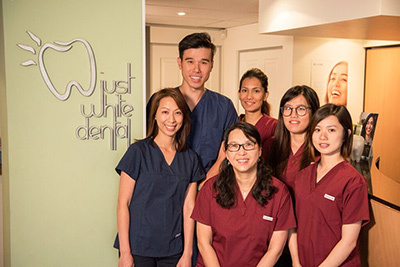 Dr Wyndham and Dr Ives set-up Just White Dental with the intention of creating a long-term West Ryde dental practice that they can continue to pour their hard work and passion into. Their point-of-difference is the fact that they have successfully created a space that families enjoy being in, as they often comment about how relaxing their entire dental experience is.